We are happy to announce that our free adult lessons will be held this week out at Nine Mile on Tuesday evening at 7:00 pm under the lights. 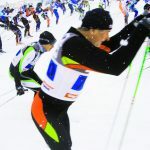 For those of you not familiar with the program, the Wausau Nordic Ski Club provides free lessons to beginner skiers who are looking to try the sport out or even get a little better then they were before. Marathon County waives the trail pass fee and any equipment rental, if needed. Please let your friends know as well. This is always so much more fun if done with friends. Plan to arrive early as you will need to register and get fitted for equipment. If you are able to provide instruction, please let Rick Barnes know so he can assign a group to you.